Our daughter Georgia was diagnosed with a brain tumour in 2004 on her fourth birthday. Since then over almost 6 years she has undergone surgery three times, two courses of chemotherapy and a course of radiotherapy. At the beginning of October we received the results of an MRI scan that suggest she is now beginning to make progress in the right direction. We were delighted when Luke from the Torbay Holiday Helpers Network phoned to invite us to stay over half term giving us the opportunity to take a break in a lovely part of the world. We had a good journey down in the sunshine to the De La Mer Hotel in Babbacombe where we were met by Luke. The hotel was decked out with Christmas decorations for a turkey and tinsel week. We had a ride on the Cliff Railway and a walk on the beach before going in to the Cliff Railway Café for an ice cream, upon learning that we were guests of the THHN we were invited back for lunch the following day. After an early dinner we made our way down into Torquay and the Riviera Centre to see “One Night Only” which included Paul Burling, Twist and Pulse and Stavros Flatley from “Britain’s Got Talent”. Luke had arranged VIP tickets for us on the front row along with backstage passes to meet the stars afterwards for photos and autographs. Tuesday saw us visit the fascinating “Bygones” which was decorated especially for Halloween, we then returned to the Cliff Railway Café for a lovely lunch over looking Lyme Bay with spectacular views as far as Portland Bill. As it was “Christmas Day” all the hotel guests were treated to a four course evening dinner. All the diners were met by the staff with Luke’s boys dressed as elves handing out presents from Santa. On Wednesday we made the short journey over to Woodlands Theme Park, complete with falconry centre, farm zoo, and rides including a stunning toboggan course down the hillside. In the afternoon we went to the Model Village who were also celebrating Halloween with giant spiders and zombies taking over the miniature town. The 4D cinema was showing a Dracula animation which was stunning. Shopping in Torquay took up most of Thursday taking in a visit to the “Living Coasts” wildlife park by the harbour. A short walk up the hill found Torquay Museum with its Agatha Christie and Devon Farmhouse displays. In the evening we were guests of Hanburys award winning Fish Restaurant, a really wonderful place to enjoy fish and chips. Nothing was too much trouble although they were very busy and turning away a steady stream of people who had not booked a table. Sadly on Friday morning it was time to say goodbye to Luke and the wonderful staff at The De La Mer. More surprises were in store in the picturesque village of Cockington complete thatched cottages, country park, stables and craft centre. OurGlass presented Georgia with an engraved glass paperweight. Rex the Blacksmith showed us around his forge and made Georgia a lucky horseshoe and had all the other people watching chanting magic words to make it go gold in colour. At Artisan Leather the girls were presented with handmade bracelets. Rick from the Cockington Carriage Company met us with his coach pulled by “Bracken” and took us on a guided tour of the park. He let Georgia drive the carriage into the village centre where a cream tea was waiting for us at the Weavers Cottage Tea Shop. Our visit to Torbay finished at Casey’s Diner in Paignton who had reserved a table for us before we had to drive home. We had a great time which was made all the more memorable by the generosity and friendliness of people and businesses who support the THHN. 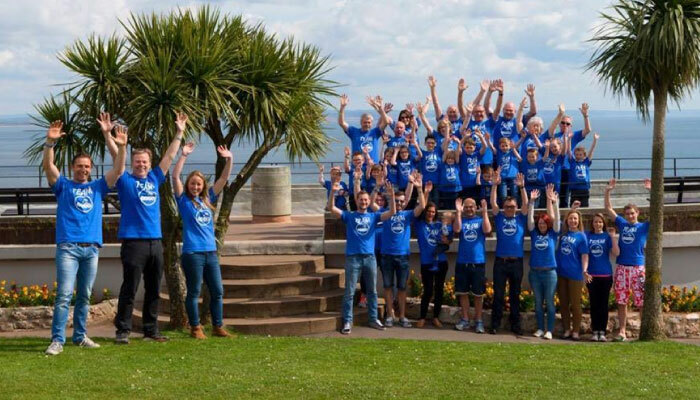 Something very special is growing in Torbay and we can’t thank you all enough for inviting us to be part of it. David, Kate, Holly and Georgia.